A German couple visiting Greece have handed over a check for €875 to the mayor of the seaport town of Nafplio, saying they wanted to make amends for their government’s attitude for refusing to pay Second World War reparations. Nina Lahge, who works a 30-hour week, and Ludwig Zacaro, who is retired, made the symbolic gesture and explained that the amount of €875 would be the amount one person would owe if Germany’s entire war debt was divided by the population of 80 million Germans. They apologized for not being able to afford to pay for both of them. “We are ashamed of the arrogance, which our country and many of our fellow citizens show towards Greece,” they told local media in Nafplio, southern Greece. The Greek people are not responsible for the fiasco of their previous governments, they believe. “Germany is the one owing to your country the World War II reparation money, part of which is also the forced loan of 1942,”they added. The couple was referring to a loan which the Nazis forced the Greek central bank to give the Third Reich during the WWII thus ruining the occupied country’s economy. 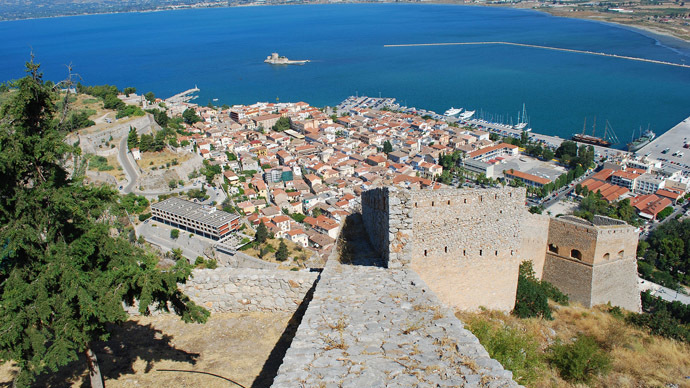 The mayor of Nafplio, Dimitris Kotsouros, said the money had been donated to a local charity. Greece’s new left-wing Prime Minister Alexis Tsipras has brought up the issue of war reparations as a bargaining chip with Germany in negotiations with the Eurogroup over restructuring Greece’s massive debt. Athens is struggling with debts amounting to 175 percent of its annual economic output. Facing default and possible exit from the Eurozone, the European Central Bank (ECB), the European Commission (EC), and the International Monetary Fund (IMF), known as the Troika, have bailed Greece out in return for tough austerity measures, which the Greeks say are becoming too much to bear. Greece has claimed that Germany owes it money for the forced wartime loan for a long time, but this is something that most politicians in Berlin refute. After unconditional surrender in 1945 Germany did not agree to clear up reparations, although then it was financially bankrupt, and at the time Greece, as well as many other countries, made no objections. Although some legal experts believe Athens may have a case, Germany is widely seen as having tried to make amends for its Nazi past, a legacy that continues to shape its diplomacy. “There’s no (justified) claim. The Greeks should do their (economic) homework and not seek culprits elsewhere,” Volker Kauder, parliamentary leader of Merkel’s conservatives, told Ekathimerini, A Greek news website.